You have to eat. But you don't have to spend as much money at the grocery store if you follow a few basic tenets. The U.S. Department of Labor estimates that the typical American family of four spends $8,513 per year on groceries. That averages out to $709 per month. And food prices are on the rise. Groceries gobble up the largest part of a family's household budget, to the point of rivaling a mortgage payment in some parts of the nation, but there are a number of things consumers can do to help out their wallet. "Make a big trip once or twice a month," Osteen advises. "The fewer times you're in the store, the less opportunity you'll have for impulse buying. Research indicates that consumers making a 'quick trip' to the store end up spending 54 percent more than they intended." A consumer who goes to the store three times per week and spends $10 on impulse purchases each trip will end up spending an additional $120 per month. By going to the store just once per week, consumers will spend only $40 per month on these purchases. Shopping once per month results in only $10 spent on impulse items. This can have a huge impact! The shop-less, save-more strategy can save families nearly $1,000 per year. Whether you're going to shop once a month or once a week, you need to be organized to pull it off. No more wandering into the grocery store after work and walking up and down the aisles trying to figure out what to eat for dinner that night. To save the most money, make a menu for the meals and snacks for that week or month and list the ingredients. Then stick to your list! If possible, shop without your children so you are not tempted to give into pressure from youngsters for an extra treat or toy that is not on the list. 3. Buy the store brand. Shoppers can easily shave several dollars from their grocery bill by purchasing generic or store brand products over national brand items. "In most cases you won't sacrifice much in quality," Osteen said. "Everything from cereal and frozen vegetables to canned goods and prescription drugs is available under a generic or store brand label. You can save from a few cents to a couple of dollars per item. The savings can quickly add up." 4. Compare stores' sales ads and cut coupons. If there are a number of grocery stores in your area, compare the weekly sales ads and plan menus accordingly. Look for cheaper cuts of meat. Chicken thighs and legs cost less than chicken breasts. Osteen said coupons also can be a good way to save money. Many stores will double coupons up to a dollar. "Be sure to compare the discounted price to the price of a store-brand product," she said. "Even with a coupon, you may be better off buying the store brand." 5. Compare prices on everything. "Be sure to compare prices on everything. Bagged apples may be cheaper than bulk apples," Osteen said. "Bagged salads will cost you more than buying the ingredients separately." Most grocery stores post the price per ounce, pound or other unit of measurement. The largest size of a product may not always be the cheapest, especially if you buy more than you will use. "If you end up throwing things out, you've wasted your money, no matter how good the deal was to begin with," she said. "Additionally, if you find that you have accumulated too many grocery items, skip a shopping trip and plan your week's meals around what you have on hand. This saves money and time." Household Hints Save Money, Simplify Your Life! 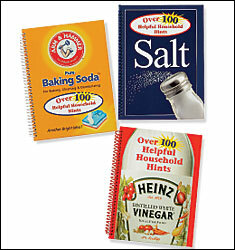 Thumb through 192 pages of over 300 tips using common household products you have at home: vinegar, baking soda and salt. Clean your home, cleanse and beautify your body, maintain good health, and much more! Each book has 64 pages. Set of 3. The Campbell's Shop has it all! It's Olive & Other Oils Month At CyberCucina!